You drink beverages every day, tasting them as they pass through your mouth. But when it comes to wine, drinking and tasting are not synonymous. Wine is much more complex than other beverages: There’s more going on in a mouthful of wine. For example, most wines have a lot of different (and subtle) flavors, all at the same time, and they give you multiple simultaneous sensations, such as softness and sharpness together. If you just drink wine by gulping it down the way you do soda, you miss a lot of what you paid for. But if you taste wine, you can discover its nuances. In fact, the more slowly and attentively you taste wine, the more interesting it tastes. The process of tasting a wine — of systematically experiencing all the wine’s attributes — has three steps, which we discuss in the following sections. The first two steps don’t actually involve your mouth at all: First, you look at the wine, and then you smell it. Finally, you get to sip it. We enjoy looking at the wine in our glass, noticing how brilliant it is and the way it reflects the light, trying to decide precisely which shade of red it is and whether it will stain the tablecloth permanently if we tilt the glass too far. To observe a wine’s appearance, tilt a (no more than half-full) glass away from you and look at the color of the wine against a white background, such as the tablecloth or a piece of paper (a colored background distorts the color of the wine). Notice how dark or how pale the wine is and what color it is. Also notice whether the wine is cloudy, clear, or brilliant. (Most wines are clear. Some unfiltered wines can be less than brilliant but shouldn’t be cloudy.) Eventually, you’ll begin to notice patterns, such as deeper color in younger red wines and older white wines. If you have time, at this point you can also swirl the wine around in your glass (see the following section) and observe the way the wine runs back down the inside of the glass. Some wines form legs or tears that flow slowly down. Once upon a time, these legs were interpreted as the sure sign of a rich, high-quality wine. Today, we know that a wine’s legs are a complicated phenomenon having to do with the surface tension of the wine and the evaporation rate of the wine’s alcohol. If you’re a physicist, feel free to show off your expertise and enlighten your fellow tasters — but otherwise, don’t bother drawing conclusions from the legs. After you observe a wine’s appearance, you get to the really fun part of tasting wine: swirling and sniffing. This is the stage when you can let your imagination run wild, and no one will ever dare to contradict you. If you say that a wine smells like wild strawberries to you, how can anyone prove that it doesn’t? Before we explain the smelling ritual, and the tasting technique that goes along with it (described in the next section), we want to assure you that (a) you don’t have to apply this procedure to every single wine you drink; (b) you won’t look foolish doing it, at least in the eyes of other wine lovers (we can’t speak for the rest of the human population); and (c) it’s a great trick at parties to avoid talking with someone you don’t like. To get the most out of your sniffing, swirl the wine in the glass first. But don’t even think about swirling your wine if your glass is more than half full. Keep your glass on the table and rotate it three or four times so that the wine swirls around inside the glass and mixes with air. Then quickly bring the glass to your nose. Stick your nose into the airspace of the glass and smell the wine. Free-associate. Is the aroma fruity, woodsy, fresh, cooked, intense, mild? Your nose tires quickly, but it recovers quickly, too. Wait just a moment and try again. Listen to your friends’ comments and try to find the same things they find in the smell. As you swirl, the aromas in the wine vaporize so that you can smell them. Wine has so many aromatic compounds that whatever you find in the smell of a wine is probably not merely a figment of your imagination. The point behind this whole ritual of swirling and sniffing is that what you smell should be pleasurable to you, maybe even fascinating, and that you should have fun in the process. But what if you notice a smell that you don’t like? Hang around wine geeks for a while, and you’ll start to hear words like petrol, sweaty saddle, burnt match, and asparagus used to describe the aromas of some wines. “Yuck!” you say? Of course you do! Fortunately, the wines that exhibit such smells are not the wines you’ll be drinking for the most part — at least not unless you really catch the wine bug. And when you do catch the wine bug, you might discover that those aromas, in the right wine, can really be a kick. Even if you don’t come to enjoy those smells (some of us do, honest! ), you’ll appreciate them as typical characteristics of certain regions or grapes. Wine can also have bad smells that nobody will try to defend. It doesn’t happen often, but it does happen, because wine is a natural, agricultural product with a will of its own. Often, when a wine is seriously flawed, it shows immediately in the nose of the wine. Wine judges have a term for such wines. They call them DNPIM — Do Not Put in Mouth. Not that you’ll get ill, but why subject your taste buds to the same abuse that your nose just took? Sometimes a bad cork is to blame, and sometimes the problem lies with some issue in the winemaking or even the storage of the wine. Just rack it up to experience and open a different bottle. When it comes to smelling wine, many people are concerned that they aren’t able to detect as many aromas as they think they should. Smelling wine is really just a matter of practice and attention. If you start to pay more attention to smells in your normal activities, you’ll get better at smelling wine. Be bold. Stick your nose right into the airspace of the glass where the aromas are captured. Don’t knock yourself out smelling a wine when strong food aromas are present. The meat you smell in the wine could really be a stew cooking on the stove. Become a smeller. Smell every ingredient when you cook, everything you eat, the fresh fruits and vegetables you buy at the supermarket, even the smells of your environment — like leather, wet earth, fresh road tar, grass, flowers, your wet dog, shoe polish, and your medicine cabinet. Stuff your mental database with smells so you’ll have aroma memories at your disposal when you need to draw on them. After you’ve looked at the wine and smelled it, you’re finally allowed to taste it. This is the stage when grown men and women sit around and make strange faces, gurgling the wine and sloshing it around in their mouths with looks of intense concentration in their eyes. You can make an enemy for life if you distract a wine taster just at the moment when he’s focusing all his energy on the last few drops of a special wine. Take a medium-sized sip of wine. Swish the wine around in your mouth as if you’re chewing it. The whole process should take several seconds, depending on how much you are concentrating on the wine. With poetic license typical of wine tasters, someone once dubbed the smell of a wine its nose — and the expression took hold. If someone says that a wine has a huge nose, he means that the wine has a very strong aroma. If he says that he detects lemon in the nose or on the nose, he means that the wine smells something like lemons. In fact, most wine tasters rarely use the word smell to describe how a wine smells because the word smell (like the word odor) seems pejorative. Wine tasters talk about the wine’s nose or aroma. Sometimes they use the word bouquet, although that word is falling out of fashion. Just as a wine taster might use the term nose for the smell of a wine, he might use the word palate in referring to the taste of a wine. A wine’s palate is the overall impression the wine gives in your mouth, or any isolated aspect of the wine’s taste — as in, “This wine has a harmonious palate,” or “The palate of this wine is a bit acidic.” When a wine taster says that he finds raspberries on the palate, he means that the wine has the flavor of raspberries. Taste buds on the tongue can register various sensations, which are known as the basic tastes — sweetness, sourness, saltiness, bitterness, and umami, a savory characteristic. Of these tastes, sweetness, sourness, and bitterness are those most commonly found in wine. By moving the wine around in your mouth, you give it a chance to hit all your taste buds so that you don’t miss anything in the wine (even if sourness and bitterness sound like things you wouldn’t mind missing). As you swish the wine around in your mouth, you’re also buying time. Your brain needs a few seconds to figure out what the tongue is tasting and make some sense of it. Any sweetness in the wine often registers in your brain first; acidity (which, by the way, is known to normal people as sourness) and bitterness register subsequently. While your brain is working out the relative impressions of sweetness, acidity, and bitterness, you can be thinking about how the wine feels in your mouth — whether it’s heavy, light, smooth, rough, and so on. Until you cut your nose in on the action, all you can taste in the wine are those three sensations of sweetness, acidity, and bitterness and a general impression of weight and texture. Where have all the wild strawberries gone? They’re still there in the wine, right next to the chocolate and plums. 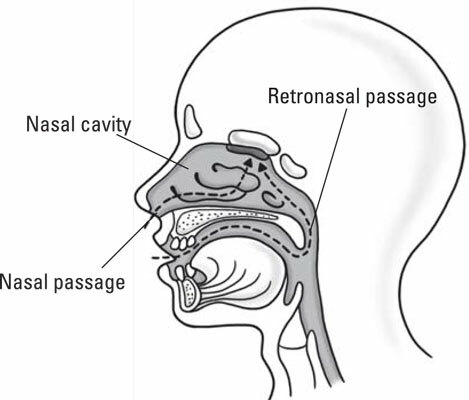 But to be perfectly correct about it, these flavors are actually aromas that you taste, not through tongue contact, but by inhaling them up an interior nasal passage in the back of your mouth called the retronasal passage (see the following figure). When you draw in air across the wine in your mouth, you’re vaporizing the aromas just as you did when you swirled the wine in your glass. There’s a method to this madness. Wine flavors are actually aromas that vaporize in your mouth; you perceive them through the rear nasal passage. After you go through all this rigmarole, it’s time to reach a conclusion: Do you like what you tasted? The possible answers are yes, no, an indifferent shrug of the shoulders, or “I’m not sure, let me take another taste,” which means that you have serious wine-nerd potential.